Last chance to visit the Community Lounge — see the mural’s completion and say hi to the team! Yesterday, I published a fairly extensive blog post outlining everything happening (and that had happened) in the Developer Garage area (the Community Lounge in particular) of SAP TechEd. If you haven’t read the post, please check it out — as everything I wrote about then applies for today (the last day of the show!). Rather than rehash and rewrite everything from yesterday, I thought this recap could include video highlights from social media instead (thus sparing you another one of my long posts). 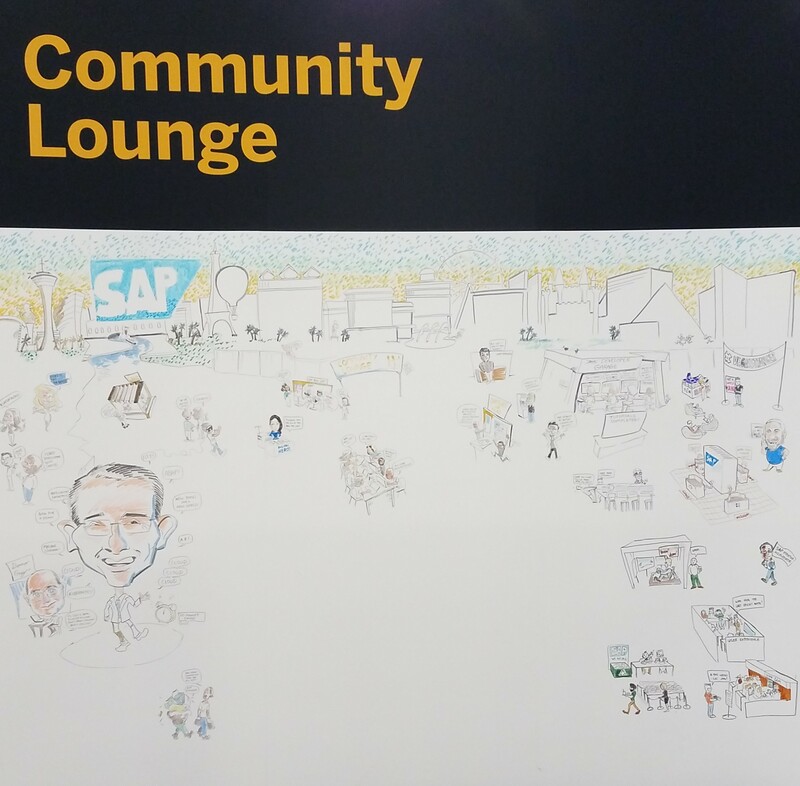 Simon Kemp, Community Hero (see full list of heroes) and co-host of the SAP Coffee Corner podcast, stopped by the Community Lounge to talk about what it’s like seeing a giant banner of yourself at an event — and to chat about building community on a regional level. Video. The guys at the “SAP Runs SAP” booth (located in the Community Lounge) gave a demonstration of their virtual-reality display — an experience that shows how SAP benefits from its own technology. Video. Kevin Muessig, one of the Evangelists working in the Developer Garage, took a moment to explain the App Space, where developers can take tutorials and complete missions to earn prizes. Video. Sarada Sarvepalli won a free pass through the tutorial contest, and she also won the top prize for completing missions at the aforementioned App Space. She came to the Community Lounge to tell us about all the exciting learning opportunities at SAP TechEd. Video. Even more videos from the show will go up today at twitter.com/sapcommunity. So please follow! Also, keep an eye on the #SAPCommunity hashtag.If you’re at the show, include the hashtag in your tweets so we can see what you’re up to! Nice summary, thank you Jerry. Go Sarada Sarvepalli, what a great journey! !